Which Way - Google Maps Timeline in all, software that synthesizes many GPS log files for each designated area. Google Maps Timeline in all, software that synthesizes many GPS log files for each designated area. This software synthesizes all the Google Maps timeline or a lot of GPS log files for each specified area. 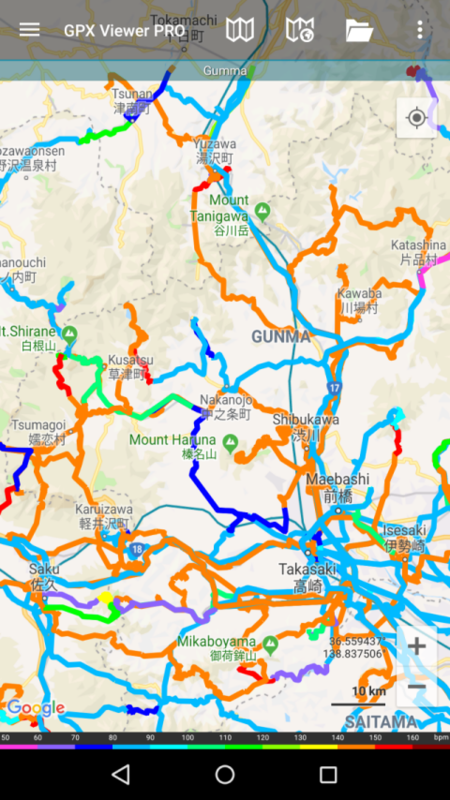 It is for people who like the Google Maps timeline, who are using Android's My Tracks (seems to be obsolete in April 2016), GPS logger etc GPS logging application and have a lot of GPS logs. Suppose you just combine everything, the software that displays the locus of GPS will die as it becomes a ridiculous file size. This software thin out the points as much as possible in the section which is going straight ahead. This software delete the trapped locus in places with errors such as in a large commercial facility. Only the sections within the range of synthesis conditions are extracted collectively. GPX Viewer (Android) is recommended for display. Both GPSLogger and GPX Viewer are famous Android applications (These are not my software). Applications like GPSLogger are recommended. · I have been around here many times. Well, which way did I passed already? I hope all the colors are on the way I passed. · I'm going to go over there next time, and I want to go on a road I have never passed. · I climbed this mountain many times, but which mountain path did I go through? · The road that is running now is dark. I do not want to be treated as "passed" like this. I wonder if the running record at night will be a dark tone. 1. Drop all the files on hand in the "Please drag and drop files here" area (KML, GPX, KMZ, GPZ formats only). 2. Specify the folder to output the decimated file, the folder to output the synthesized GPX file, and the composition condition file. 4. A black window appears. I will work a little long. - To designate an area, you can copy and paste by displaying latitude and longitude on Google Map. After the discontinuation of "My Tracks" made by Google, I'm using an application called GPSLogger. The record of the car drive is the main. In GPSLogger, if you specify "position information = GPS only, retention period = 2 seconds, GPS = always on, distance filter = 0, accuracy filter = 1000 meters, precision retry = 6 seconds, timeout = 10 seconds", you can get similar to My Tracks. 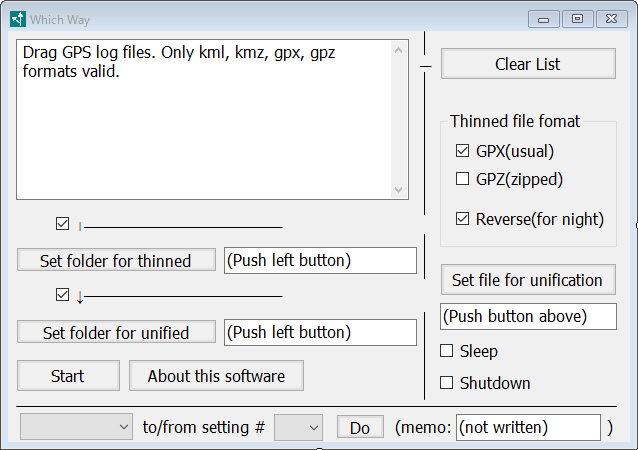 In other words, since the author has used only the kmz (kml) format and the gpx (gpz) format, these are the only formats that can be specified now. 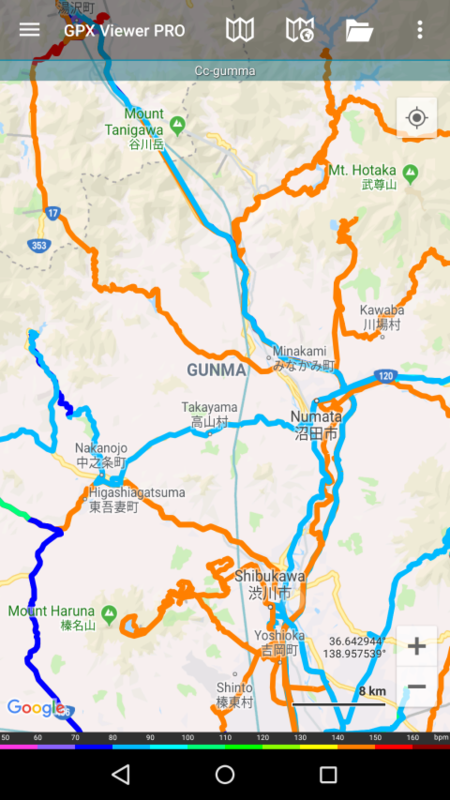 This software utilizes GPX Viewer's "Color line by data" "Heart rate" function, so that it can be displayed in orange for daytime and blue for nighttime. Activating "Color line by data" and setting "Data:" to "Heart rate" will work this function. For people with patterns that move a lot after sunset, it would be better to check "Reverse order drawing". For people with patterns that move a lot before sunrise, it may be better to uncheck "reverse order drawing". In many applications such as GPX Viewer, since the locus drawn afterward becomes the front, many loci become blue for evening people. It is "reverse drawing" to prevent this. - there is no rule that the latitude is smaller on the left side, and so on. Feel free to. Longitude is also the same. It might be easier to understand by entering the northwest in the left column, southeast in the right column. - The author has tried only the area of north latitude and east longitude (in Japan). Because there are no south latitude and western long files at hand, I do not know how it works. Please uninstall from "Control Panel - Add / Remove Programs".